Is Marijuana Good for Treating Your Anxiety? I was 18 the first time I smoked weed. Unlike most other pot-smoking 18 year olds, I did it for medicinal purposes — honestly! In fact, I was very anti-weed, and admittedly, judgy towards people who smoked. The year prior, I was the vice president of the Students Against Destructive Decisions club at my school. However, desperate times called for desperate measures. My anxiety was at an all-time high during my freshman year in college. I had trouble adjusting (to say the least). I came home almost every weekend to try to seek solace in my comfort zone. But my stress level was so horrible that even being home couldn’t help. I was hanging out with two of my friends who were still in high school, and I was feeling extremely on edge and extremely, extremely nauseous. You see, my anxiety loves to manifest itself physically through my gut. Stress always made me sick to my stomach. Pinching the skin on my thighs, trying not to vomit, I meekly asked in an unrecognizable voice, “Can I have some of that weed?” This wasn’t a destructive decision, right? Right!? They looked at each other in disbelief, laughed, and then handed me a bowl (pipe, for the uninitiated) and lighter — neither of which I knew how to use. I smoked, coughed up a lung, and repeated. Then, at some point… I felt better. It was a miracle. Now, there are two sides to the story. While marijuana has made me relax, and feel anxiety free many a time, it has also led me to near nervous breakdowns. During those times, my heart raced a million miles an hour, and I was convinced I was peeing my pants (Don’t worry, I 100% wasn’t). It’s not just me, either. Marijuana affects different people differently. And different strains of marijuana can affect the same person differently. At times, the effects of the drug can be rather unpredictable. It’s strange to think that the same drug that can result in a person feeling totally zen can also result in triggering a full blown anxiety attack. So, how does weed work, anyway? There’s a chemical in our brain called anandamide which is pretty structurally similar to THC (tetrahydrocannabinol), the active component in marijuana that gives you a psychoactive “high.” So, when THC enters your body, it sort of recognizes it. The THC attaches to cannabinoid receptors and disrupts “normal” mental function as we know it, resulting in a high. That’s the short version. For many years, people have been using marijuana as an alternative treatment for anxiety. Now, as marijuana continues to become legalized for medicinal, and recreational, use in many states, it’s becoming more common to look to weed as an anxiety remedy. While there aren’t a ton of studies concerning marijuana and anxiety, especially long term effects, many people with anxiety are benefiting from marijuana… unless of course they have an adverse reaction like I described before. As for why the drug affects people so differently, there are many factors — many of which are out of our control. There are factors within us that determine how we’ll vibe with weed, such as age, body fat, and genetics. Believe it or not, even growth and harvest conditions of the marijuana plant itself can impact the way it makes us feel. There are some things we can control when it comes to marijuana usage. 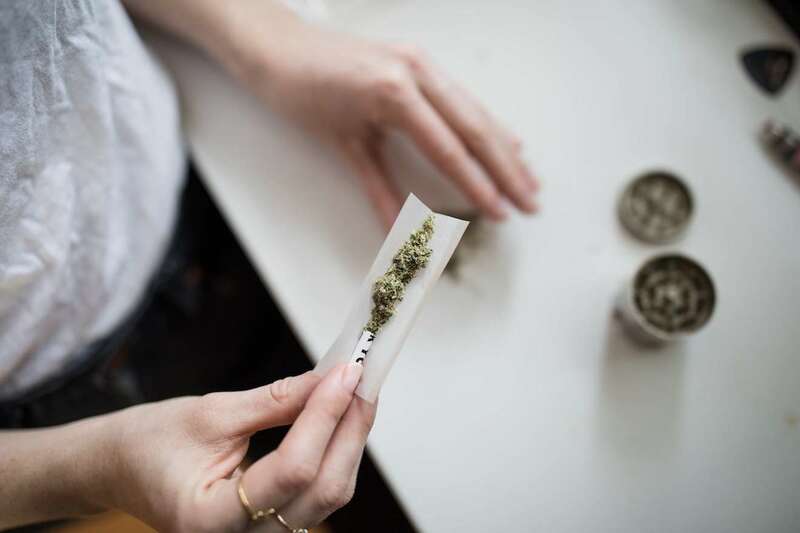 While there isn’t enough research in general on the topic, there are some rules of thumb and precautions we can take if using marijuana to help anxiety. When purchasing marijuana from a dispensary, you can be sure of the THC content. Labels will let you know exactly how much THC is in those gummies or cookies. When it comes to using marijuana to relax, less is more when it comes to THC, especially when starting out. To add onto all the different highs that different strains can produce, the way you consume the drug also makes a big difference. Even when it comes to smoking weed, there’s a few different options, like joints, bongs, or bowls. By smoking the drug, you might feel its effects within a minute. If you ingest it in food or “edibles” it can take a half hour or longer to feel any effects. One specific reason why marijuana has the calming effect that it does is because it affects the neurotransmitter GABA which can stop anxiety in its tracks. GABA levels are what are targeted by benzodiazepines — common prescription anti-anxiety drugs! Marijuana can also lower cortisol, the stress hormone, when used regularly, as one study found. A more widely accepted/less controversial option is CBD oil, which is easy to come by these days. It doesn’t contain THC, so you won’t get high, but you will reap the anxiety reducing benefits. CBD alone is considered to be pretty safe. It’s thought to work by affecting the CB1 receptor in the brain, which in turn positively affects serotonin levels. There has been some promising research surrounding CBD! In one study with both human and animal subjects, anxiety was significantly decreased in subjects who received 400 mg of CBD as opposed to a placebo. Another study showed the effectiveness of CBD for relieving social anxiety during public speaking. Marijuana isn’t for everybody, but there’s no denying that at least for some people, marijuana (or some component of it) might be beneficial. If you’ve never tried marijuana or if you’re on the fence about it, it’s nice to know there’s another option out there for you to try. If you’re in a state where medical and/or recreational marijuana is legal, go ahead and get stoned, but understand that it may heighten your existing anxiety. Hopefully, you’ll simply find yourself a lot less stressed out… and a lot more giggly.